I watched this series of videos on YouTube yesterday, prompted by “The Film Theorists”, and didn’t even know what to think. It was the weirdest adventure. They start off like educational videos and then go into a creepy sequence of disturbing images and shock moments. “Don’t Hug Me I’m Scared” has got to be the most beautiful and artistic creation I’ve seen so far. Unlike some viral videos, this one makes you think. It’s deep and layered with a message that is not so easy to understand. The unpredictability witnessed by someone who has never watched these is amazing – it was especially for me. Now, this sixth and final one (though fans have tried to make their own theorized 7th) is obviously dealing with death. The three puppet friends are in some kind of purgatory. Scenes, characters, and dialogue from the previous episodes are featured. The Yellow Guy lies in bed thinking about his friends that have gone missing, reflecting with an old photo album. The talking lamp tells him how he can dream about the most morbid and nightmarish things and then characters from the previous episodes, such as the steak and clock, randomly appear and disappear in the room one by one, faster and faster until Yellow Guy is going insane. Oh, and the songs in these videos are catchy as ever, especially in the first video that sings about creativity. “Green is not a creative color”. Why? The first one was probably supposed to be a one time thing done for kicks, but after people started talking about it and theorizing, a Kickstarter program was initiated to fund the second and subsequent ones. I must have watched the sixth one numerous times. It’s such a timeless creation. The whole series, while rather short, is unique. It’s time to fund a “Don’t Hug Me I’m Scared” feature length film. This picture that was posted on imgur about a week ago has gone viral. The expression on this woman’s face is priceless. She seems very upset (pertubed the husband said) after her husband wouldn’t go on the Splash Mountain ride with her, probably afraid of getting wet. I seriously think she looks like Willem Dafoe. Now the only question that remains is if she is single again. 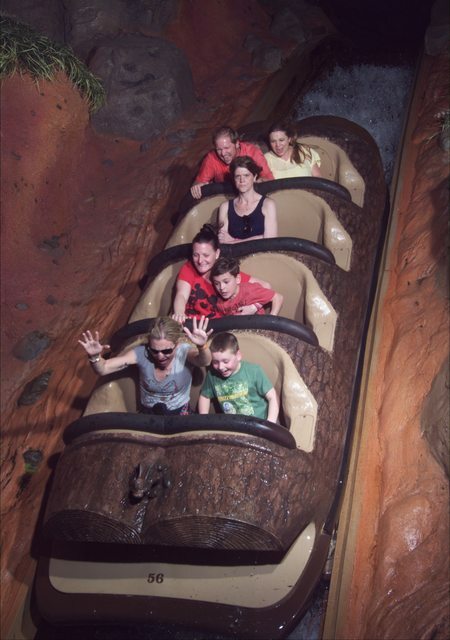 I seriously don’t think the husband had anything to worry about: the ride doesn’t look like it even got wet at all. Everyone else looking excited as ever while she folds her arms in disgust makes the photo very effective. I guess all in all, in these situations, you just have to go with the flow, both literally and figuratively.